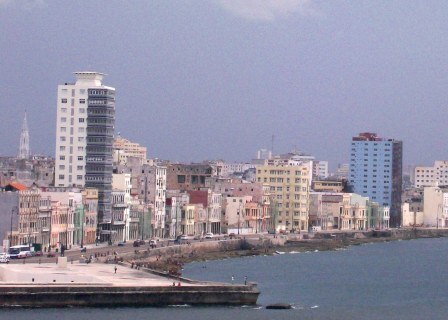 The Malecon seawall runs about 4 miles, from the Bay of Havana at Old Havana, to the Almendares River in El Vedado. It’s a place where everyone gathers at some time, to take their cares and worries off their shoulders as they talk with friends, cuddle with a sweetheart or just gaze endlessly out to the rhythmic sea. 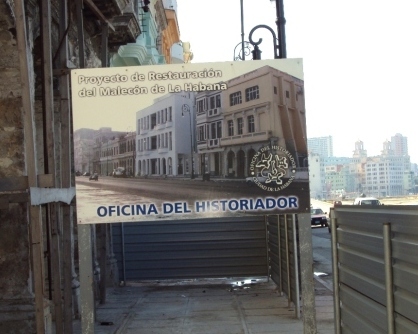 Construction actually began in the early 1900s. Today it is the main arterial road carrying endless traffic and supplies from one end of the city to the other and then out to the suburbs. Cruising the famous seafront, you can see that it is now being restored building by building in the area known as Central Havana. Across the street from the seawall, construction workers toil to repair nature’s damage to the historic buildings. There is no caterer’s truck to give them a snack, nor water to refresh them in the heat. Cuban workers carry their own meals in a tin lunch bucket. 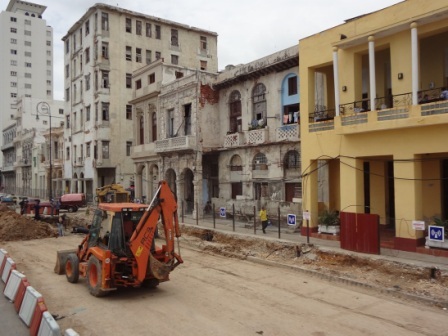 The hurricane season every year takes a terrible toll on these structures. The workmen use rudimentary construction materials and work miracles which may not be long-lasting. Much of the Malecon at night is a meeting place for young lovers, a popular stroll for hustlers of all stripes, and some areas are a gathering place for gay men. As you come towards the end of the sea wall, you can look back and see the entire sweep of where you have walked. In front of you lies the US Interests Section.